Frankfurt International airport is the operational base of Lufthansa airlines and a major aviation hub in Europe, and is located just twelve kilometres away from the city of Frankfurt in Germany. 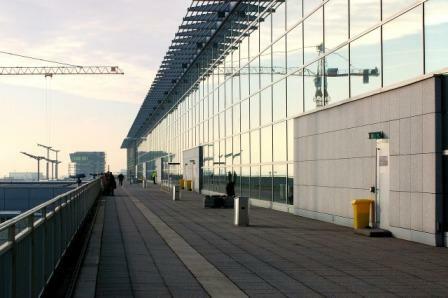 Its strategic situation in one of the world’s financial capitals and halfway between the eastern and the western side of the continent makes it a frequent stop for passengers on long-haul journeys from one continent to another, as well as for business travellers attending conferences, conventions and networking events at the Messe Frankfurt exhibition grounds. Apart from those cases when you fly to Frankfurt airport in Germany for work or tourism purposes, you are likely to have a layover in FRA if making a connection with any of the following airlines: Aegean Airlines, Aer Lingus, Aeroflot, Air China, Air Europa, Air France, Air India, Alitalia, American Air, Asiana, Austrian Airlines, British Airways, Cathay Pacific, Condor, Delta, Easyjet, Emirates, Finnair, Iberia, Icelandair, Japan Airlines, KLM, Korean Air, LOT Polish Airlines, Lufthansa, Qatar Airways, Ryanair, Royal Air Maroc, SAS, Singapore Airlines, Swiss, Tap Air Portugal, Turkish Airlines, United and Wizz Air. You have four options to sleep in Frankfurt International airport without leaving the complex: three of them are found on the landside (public area) and one of them on the airside or restricted area after security, therefore only accessible to passengers in transit and in possession of a boarding pass. All airport hotels in Frankfurt, Germany, are located in Terminal 1; there is a Hilton Garden Inn right next to the terminal building, a Sheraton (which is both hotel and conference centre) offering direct access to the terminal, a Hilton in The Squaire on top of the airport’s railway station and a transit hotel –the My Cloud- in the international departures concourse. If you need more details before deciding which airport hotel in Frankurt, Germany, suits your travel needs best, see our recommendations below. When it comes to spending the night in Frankfurt airport, staying in the Sheraton enables you to make the most of your layover as you will not only get the chance to rest and refresh yourself before resuming your journey, but also to organise the last business meetings and events in the city. Located within short walking distance of the departures public hall, it provides comfortable soundproofed guest rooms, a fitness centre, wellness facilities and two onsite restaurants. The Hilton Frankfurt airport hotel, a relatively new construction in the known as Squaire building inside the airport complex, is on top of the railway station. Its wide array of guest amenities particularly attracts travellers making a connection here before continuing with their holidays, an Europe tour or even a world trip: it offers complimentary spa access and its rooms and suites are fully-equipped with coffee maker, free WiFi, flat-screen TV, safety deposit boxes and room service. The Hilton Garden Inn Frankfurt Airport caters to the specific needs of those travelling for work, but also of holiday goers and explorers. If you are sleeping in Frankfurt airport before going back home from a visit to Messe Frankfurt, you can rest assured that your room will have the required atmosphere and facilities to complete your work, send your reports and even have them remotely printed at the onsite business centre without leaving your bed. A daily breakfast buffet is served. The MyCloud hotel for passengers in transit in Frankfurt airport is available exclusively to travellers passing through the restricted boarding area of Terminal 1 (non-schengen zone) to catch a connecting flight within the following hours or early on the following day. In spite of being a transit hotel, all rooms are fully-equipped, feature private bathroom and entitle you to use the WiFi internet network at no extra charge. This property is found next to gate Z25, so you are advised to confirm whether you will have access to this area of the airport (dedicated to non-schengen operations) before making your reservation.